Caladh Nua is a tightly-knit, vibrant, and staggeringly talented band with its origins deeply rooted in the Southern counties of Ireland. 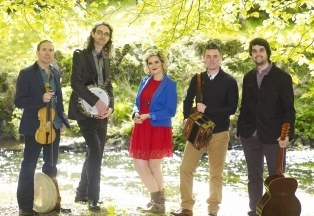 Comprised of five versatile musicians and singers playing a wide selection of instruments - from banjo to fiddle, guitar to bodhran, and tin whistle to button accordion - the band has captured the essential qualities of traditional Irish music and balanced them finely with an innovative contemporary flair. Through a series of international tours and festivals across the globe, taking the stage in cities such as Paris, Vienna, Copenhagen, Berlin, Mumbai and Vancouver, Caladh Nua has cast a uniquely captivating net of Irish music and song over an ever widening worldwide audience.